A signature fashion-forward look with the high performance and durability of titanium. Lightness becomes an aesthetic element, together with the purity of the style of Dolce and Gabbana, the distinction of materials and finishing. Comfort and Wearable are the key words. Domenico Dolce and Stefano Gabbana founded Dolce & Gabbana in 1982, gaining widespread praise after the revelation of their first women’s collection in Milan in 1985. The pair opened their first boutique in Tokyo in 1989. They presented their first men’s collection in 1991, the same year that Madonna famously wore one of their shirts to the Cannes Film Festival. They have expanded their product lines to include fragrances, undergarments, handbags, shoes, swimwear, eyewear, and jeans. The label is known for signature styles like corset dresses, leopard print, and sleek three-piece pantsuits. 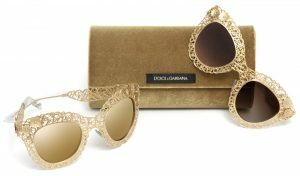 The Dolce and Gabbana collection is available at Good Looks Eyewear. Visit our Pittsburgh or Cranberry Township location to pick up your glasses or sunglasses.